During a survey in 1970 geologists of the National Geological Service of the Netherlands2 came across a series of prehistoric flint procurement sites in valley slopes near Valkenburg aan de Geul. The type of flint extracted was named Valkenburg flint after the municipality concerned. Research in archives and sources showed that as early as 1929 ‘ancient’ antler picks had been found in local chalk quarries and brought to the attention of prominent amateur archaeologists that were in touch with professionals. There was, alas, no follow-up. In 1941 a Valkenburg flint exploitation site was mentioned in a well- known book on Dutch archaeology3, but the reference somehow was overlooked for a long time. In the decades following the 1970 discovery about 24 possible extraction sites of Valkenburg flint became known by surveying at or close to raw material outcrops. They are to be found in valley slopes of the rivers Maas and Geul and the slopes of dry valleys that run into these. Several Neolithic extraction zones have severely been damaged or almost been obliterated by (sub)recent chalk quarrying. Judging by the length of some of the zones the Neolithic output in kilograms of flint must have been considerable. Valkenburg flint can be extracted from the Emael and the Schiepersberg Member of the Maastricht Formation and from residual loams, be it that the actual Neolithic extraction from solid rock up to now has only been documented in the Emael Member. Nodules and tablets can be huge, several metres even; they mostly are over 30 centimetres. It is a rather coarse-grained type of flint, which makes it particularly suitable for the production of axes. When freshly extracted Valkenburg flint is an excellent raw material and translucent to a certain amount. Artefacts embedded in the soil however are very susceptible to weathering, giving them a rough and dull, almost quartzitic appearance. Extensive dissolvement of silica in some cases can lead to a weakening of the flint in such a way that flakes can be broken in half by hand. Most suitable lithic raw materials have been used on a low level in prehistory from the time when they were first discovered, but usually a period of optimal exploitation can be determined. This goes for Valkenburg flint as well. Levallois flakes and handaxes are known, as are Magdalénien blades. In the Early Neolithic it was used on a more regular basis, but still to a limited degree, in settlements of the Linear Bandkeramik for the production of blades. At the time of the Michelsberg Culture (Middle Neolithic A) rough-outs for axes were in demand and the extraction of Valkenburg flint probably intensified, reaching its peak during the Middle Neolithic B (Wartberg/Stein/Vlaardingen Complex: WSV). For twenty years it was assumed that Valkenburg flint was extracted by simple open cast mining and the first extraction feature discovered in an archaeological excavation (Valkenburg-Biebosch) in 1990 was a pit indeed. Higher up the slope a shallow linear shaft (5.5x1x3 metres) was uncovered with galleries 2.5 metres long, the latter making this a true mine. A narrow passage in the side-wall of one of the subterranean workings connected it with the gallery of an adjacent mine. Clearly a zone where the flint type had been extracted underground had been found. In 1992 at the Plenkertstraat, a road leading out of the small town of Valkenburg, deep shaft-and- gallery mines were identified and investigated. They at some time in the past had been cut into by chalk quarrying, in part in relation to a widening of the road, leaving them for everyone to see. The remains of 7 mines were recognized, with shafts several metres wide and 4 to 6, in one case probably more than 8.5 metres deep. Radiocarbon dates of 3620-3090 cal B.C. and 3630-3340 cal B.C. for the Plenkertstraat mines fit the assumed peak exploitation aforementioned by the WSV-complex. Dates from Valkenburg-Biebosch and other exploitation sites are younger, but fit the WSV-complex as well. The antler picks discovered in the early 20th century in a chalk-rubble deposit which formed the top layer of quarries that have destroyed parts of the procurement sites Valkenburg-Hoorensberg/Geböschke and Schaelsberg, are considered to be related to shallow open mining. In the Biebosch pit and most mines investigated (Biebosch and Plenkertstraat) characteristic mining implements called Kerbschlägel (notched flint picks) have been found with pulverized chalk still embedded in flake-scars at the working end. Kerbschlägel are also known from other Valkenburg flint extraction sites, as yet as surface finds only, and e.g. the German Neolithic quarrying site of Aachen-Lousberg. The nodules mined have in part been processed at or in the immediate vicinity of extraction sites. Amongst the waste material rejected rough-outs for axes can be found. Others nodules were taken to settlements at some distance and worked there. Also waste concentrations (workshops) situated at the edge of plateaus up to 5 kilometres from the primary sources were discovered during surveys. There too predominantly rough-outs for axes seem to have been produced. 1 Mainly based on Brounen & Ploegaert 1992 and De Grooth 2011. Additional information (photographs i.a.) at http://www.vuursteenmijnen.nl/valkenburg/. 2 Since 2005 Geological Survey of the Netherlands, part of Netherlands Organisation for Applied Scientific Research, TNO). Amkreutz, L.W.S.W, 2013: Persistent Traditions. 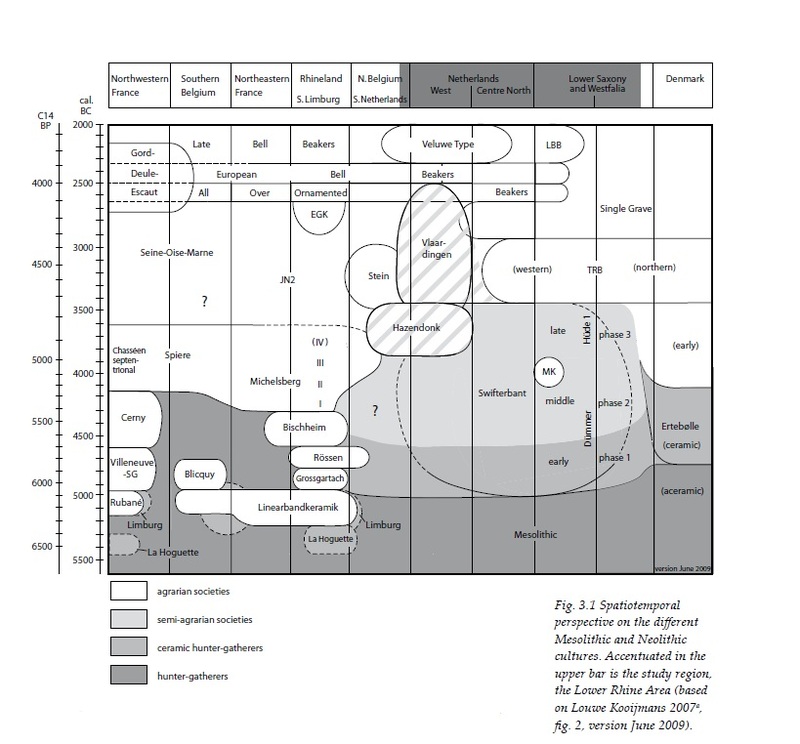 A long-term perspective on communities in the process of Neolithisation in the Lower Rhine Area (5500-2500 cal BC). Bijvanck, A.W., 1941: De Voorgeschiedenis van Nederland. Brounen F.T.S & P. Ploegaert, 1992: A tale of the unexpected: Neolithic shaft mines at Valkenburg aan de Geul (Limburg, The Netherlands). Analecta Praehistorica Leidensia 25, 189-223. Grooth, M.E.Th. de, 2011: Distinguishing Upper Cretaceous flint types exploited during the Neolithic in the region between Maastricht, Tongeren, Liège and Aachen, in: J. Meurers-Balke & W. Schön (Hrsg. ), Vergangene Zeiten: Liber Amicorum: Gedenkschrift für Jürgen Hoika, Bonn (Archäologische Berichte 22), 107–130. The foundation ‘In onsen Lande van Valckenborgh’ maintains the flint mines at Plenkertstraat in Valkenburg and conducts and assists in local and regional archaeological research. The IoLvV foundation aims to promote cultural and prehistoric knowledge and to preserve the cultural heritage of Valkenburg and the region through educational activities and publications.